This weekend, there were moments of frustration, despair, and all out rage - each aimed at a small pendent and a pile of beads. 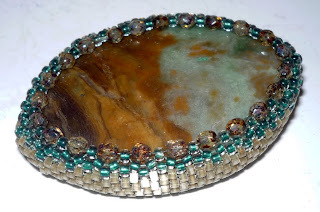 Trying to figure out how to lock in a cabochon using a tubular peyote stitch without any instruction is simply infuriating, but I did it. I did it! It began with an innocent trip to the bead store with the boyfriend on an overcast day. He is a wonderful man who actually enjoys going to store with me, offering insightful opinions on this stone and that, this bead pairing and that - not to say that we always agree. He did find this pendent for me though. Immediately, the beaded settings I had seen in magazines came to mind. Don't they just remind you extravagant old pieces found in days of yore? I have been eagerly awaiting a chance to try it out. This piece will hang on a multi-strand necklace that I'm still working on, utilizing the same champagne, turquoise and brown beads in addition to a splash of amber. It's all rather exciting, and I'm hoping to finish it in the hotel this week while traveling for work. I wish you spoke more about what changes you made to make it work rather than the weather and your boyfriend.